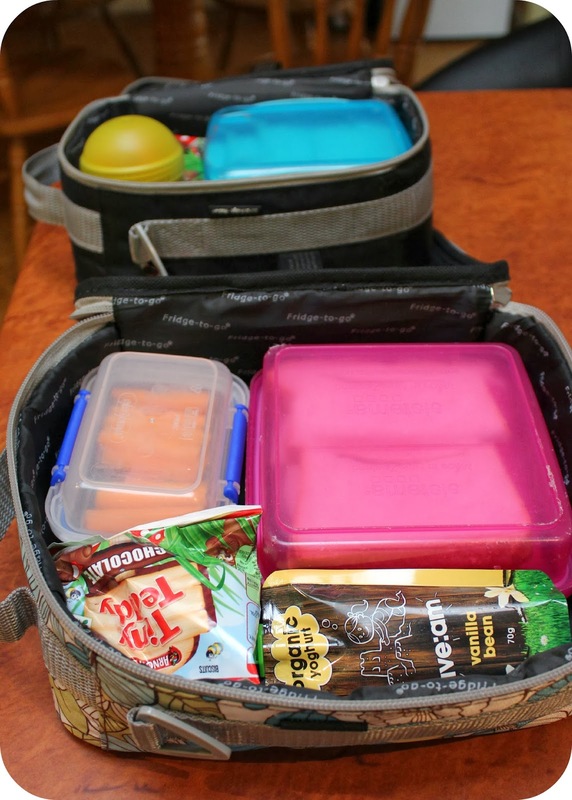 Girls Wear Blue Too: How do you organise Lunch boxes? 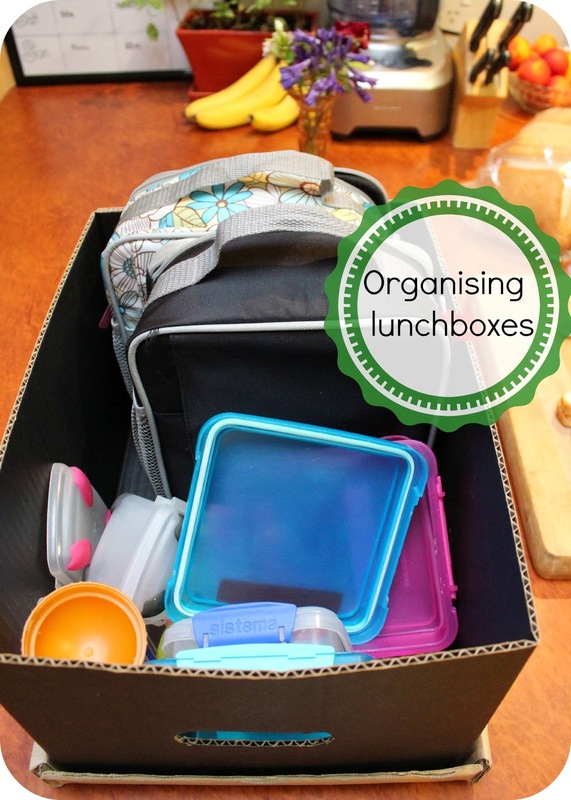 How do you organise Lunch boxes? Around 3rd or 4th term last year I got so totally fed up with the lunch packs my kids had been using, they were so difficult to clean and the linings were splitting. A friend recommended fridge to go when I admired her toddlers lunch container, so I made the plunge and purchased a medium lunch cooler bag for each of my Children and I am ever so pleased I did! The fridge to go bags have a zippered pocket that you slip a cooling panel into, everything sits against this frozen panel keeping it cool and fresh all day. We don't put drink bottles into ours we only use them for food with the water bottles separate. 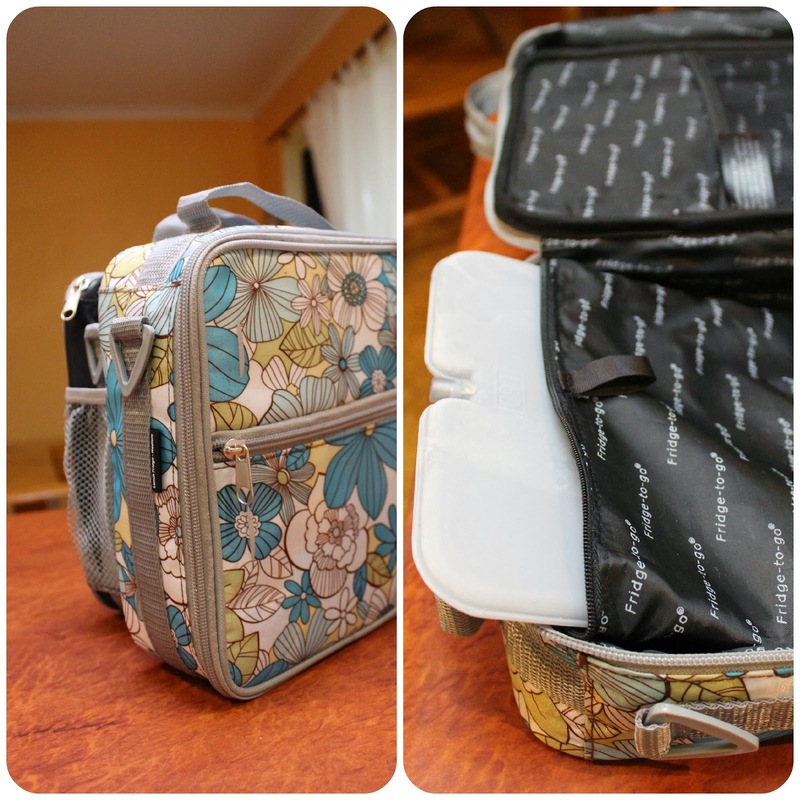 The fridge to go packs also have multiple pockets and compartments for little bits and bobs. So for example if my Children have something that they require a spoon for I can tuck the spoon into the half mesh compartment inside the top which keeps it secure and they can find it easily. I like that the design of these means you open them flat and the kids can see all that is on offer at a glance. Since we started using these more food is being consumed at School and less being bought home uneaten, I believe that the visibility factor has a big part to play in this change. unpacking their own lunch packs in the afternoon. This entails taking out the containers and placing them on the sink, emptying out crusts into the bin if need be, putting the cooling panel into the freezer and the lunch pack back into my 'lunch box' box. My 'Lunch Box' Box came into play when the packs were not being placed nicely in the cupboard and the selection of smaller containers that fitted neatly inside were being taken away for use elsewhere. My box, is simply a cardboard box that sits neatly on a shelf in the cupboard. It contains a selection of containers that fit nicely in the packs along with the packs themselves when not in use. Throwing their lunch bags into a box makes it an easy and more appealing option for the kids, it keeps all I need in one place and hides any mess. When preparing lunches in the mornings I whip the whole box out onto the counter and take what I need from it as I go. When I'm finished its just a matter of popping the box with its left over containers back onto its shelf. I love being able to just randomly throw all the containers back in here after they have been washed up. Its a quick and easy to maintain system. If tiny teddies are not in there something home baked goes along with a sandwich, some fruit or veg and often a yoghurt. I try to avoid one use packaging in lunch boxes where possible but the kids will eat yoghurt from a tube more readily than with a spoon at School so nutrition wins out over packaging in this circumstance. Teddies come into play when I haven't been baking or its too hot for baking as is the case often lately. They look like good lunch boxes, Tammy. I am not sure what my daughter bought her girls but I will let her know about these. It is 40 degrees a lot of the time where they live in the Outback and I think the girls can put their lunch into a fridge...at least in Kindy and Prep but not sure about the older grades. How does the lining sit inside? Does it have that nasty ridge that crumbs get stuck in? If you scroll down a bit you will see she has a pic of it open when empty so you can see how the block fits over the base.